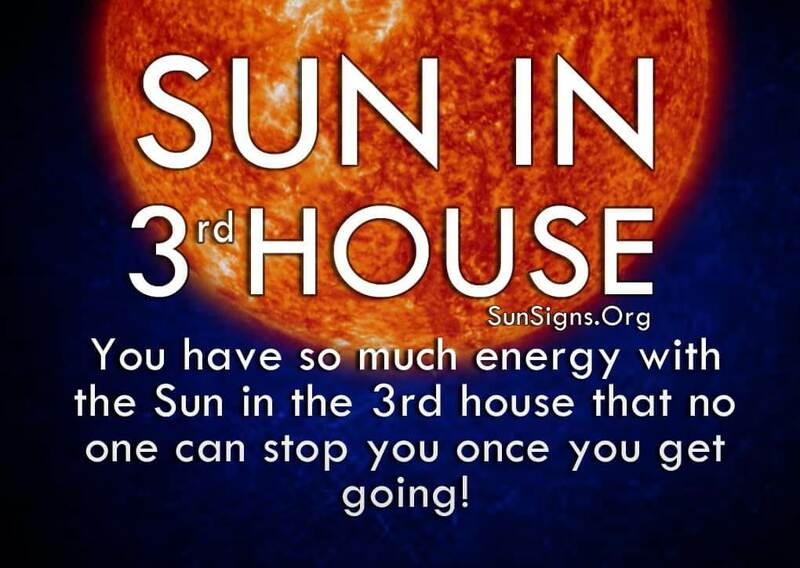 You have so much energy with the Sun in the 3rd house that no one can stop you once you get going! Your restless nature keeps you busy and you would not have it any other way. Sitting still is never an option for these people as Mercury is their ruling planet. You always find more exciting opportunities. The Sun in astrology represents your originality and courage. You take pride in the fact that you want to learn more and do more every day. Your quest for knowledge is endless and is what drives you to gain new experiences as often as you can. You feel the best way to live life to the fullest is to visit new places, meet new people, and learn everything you can about different cultures. Because you are so open-minded you get along with all walks of life and your social circle is wide. Because you have so much experience under your belt, this also helps those born with the Sun in the third house in their natal chart, to understand who you are and what makes you tick. This kind of sense of self-awareness helps you to go after what you want in a manner best suited to your tastes. You’re not conflicted about the best way to do something. Your confidence helps you to shine no matter what. And because you’re so knowledgeable about the way the world works, you instinctively know what to do to make things happen. But the best part about your personality is your selflessness. You use your natural skills to help others find out what they want from life and give them the tools to obtain it. Because you are so close to your friends and family you will do whatever it takes to help them get ahead in life. As the ruling zodiac sign for the sun in 3rd house is Virgo, the only thing that can get you into trouble is your vast set of friends and acquaintances. Sometimes you spread yourself too thin trying to help everyone at once. You have to prioritize your time and efforts because, as much as you may want to, you can’t be everywhere at once. And while you may feel you are being very helpful, others may think you are butting into their life if you don’t ask first. Sometimes you can come off as a know-it-all when you begin lecturing people about something that would be good for them. While it’s fine to be proud of your education, and you should never let anyone tell you otherwise It is possible to go overboard with your Karmic life lessons. Sometimes people want to and need to, figure things out on their own. Those born with the Sun in 3rd house in their horoscopes have a knack for understanding people and what motivates them. This also makes them a great communicator. Your love of learning translates into wanting to teach others your vast knowledge. You know how to convey information so that everyone around you knows what’s going on and can appreciate life as you do. Always make sure to offer your help first before diving in and showing off your extensive knowledge of the world. Sometimes you can get caught up in your own head without realizing that others are getting bored by your dissertation on the best ways to live life. Luckily, your ability to adapt to any situation always gets you out of a jam. Because you are able to go with the flow, you love wherever it takes you. Has Your Friend Become Your Lover?